Locations: Southern Illinois and more…. 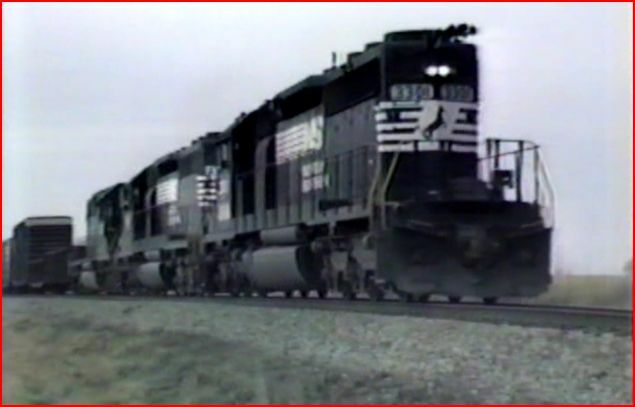 This latest installment in Diverging Clear Productions Heritage Series, features early Norfolk Southern. Videographer George Redmond lived within close proximity to this railroad. He filmed a large amount of the action in southern Illinois. 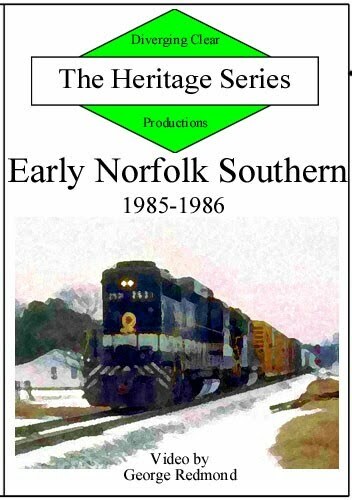 The Heritage Series has been loaded with older material, that will interest railfans and model railroaders. 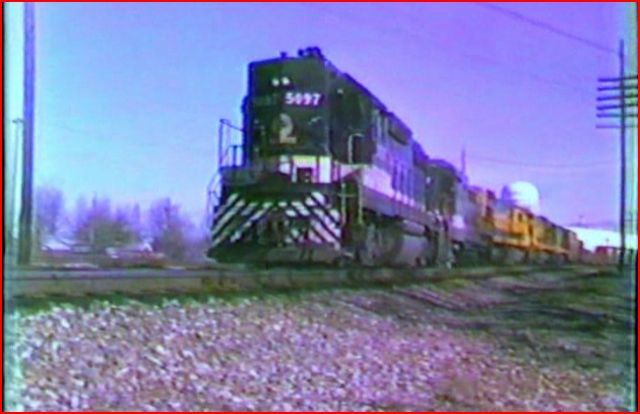 These are basic train videos on DVD. Is this the best one yet? Diverging Clear Productions has been upgrading their product line. The DVD-R discs are now directly screen labeled. A map will appear on the rear packaging of each new release. Action at Louisville, seen above. Even more locations are from: Indiana, Kentucky and Alabama. George has filmed a nice assortment of pacing sequences. Amtrak gets paced too. A graphic states the video has been color corrected, as much as possible. These shows were originally shot on early consumer grade video camera. They were nice to have, in their time. They did have issues and maybe a consideration, for modern viewers. The main issue is the amount of information crammed onto the relatively small tape. The colors tend to run together and you see flaring, tinting, and more oddities. These are nearly impossible to fully correct. Check the screenshots. Age can also make things worse. On this new release, there is noticeable improvement. Still some problems, but better overall. Considering the original tapes are nearly 30 years old. We are fortunate to have the shows available. The historic interest for those who care, is what makes these films worth a look. 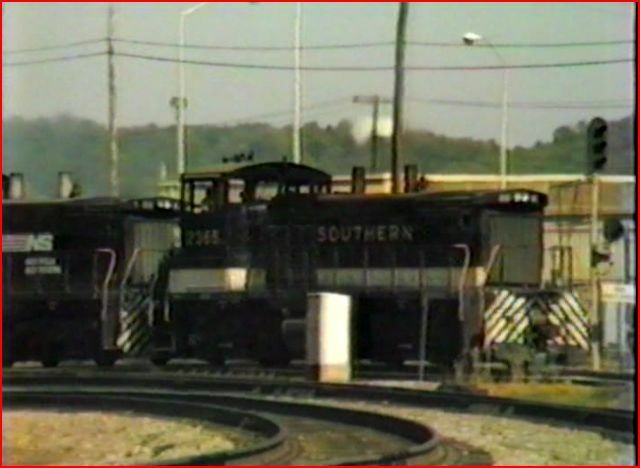 Southern and NW both, fielded an interesting diesel roster. 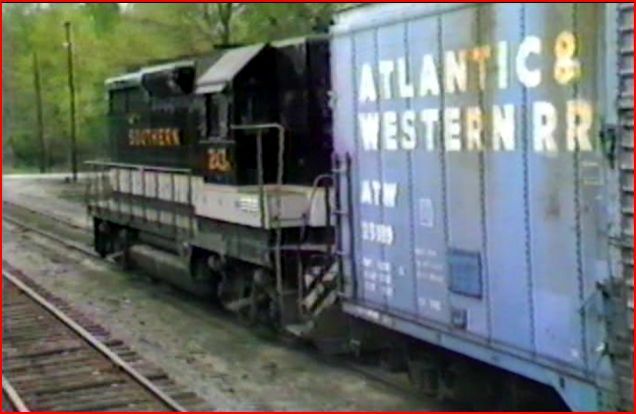 Beside a unique, long hood forward operation, there are still cabooses on many of the trains! Many rare models do appear in this show. 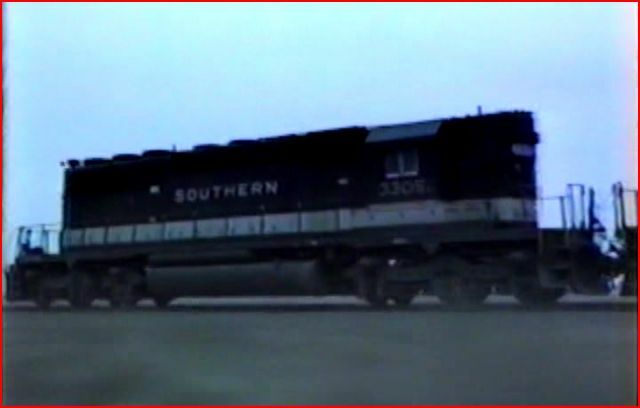 High hood models: GP30, GP35, GP50, GP50 and SD45 are all found here. Newer SD60 and C39-8 units as well. Norfolk Southern’s ‘ Thoroughbred’ livery appears on the new and repainted locomotives. 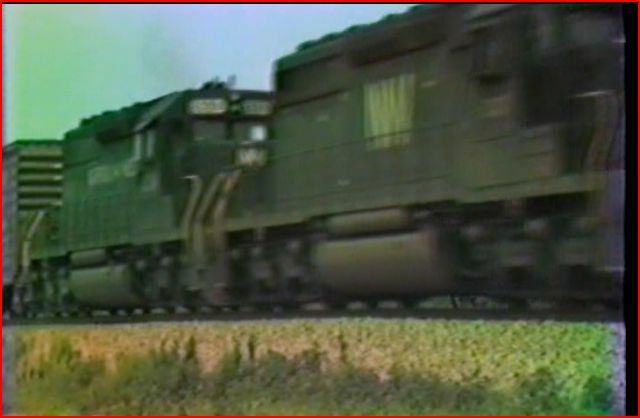 Norfolk and Western units usually trail in the locomotive lash-ups. Not many NW diesels. Mary McPherson produces the Heritage Series programs. Narration, script, editing and the rest. Her narrative is sparsely constructed. There are the usual train move details and often specific dates. She is not one to callout locomotives much, but points out some models. Natural environmental audio sounds really authentic. Numerous locomotives are sounding the airhorns, and it does get loud! Sometimes there is wind noise etc.. My favorite non train sound is a dog, barking endlessly as a train passes. Seriously, the show features the audio from the trains. Editing is the sharp, best so-far, in this series. 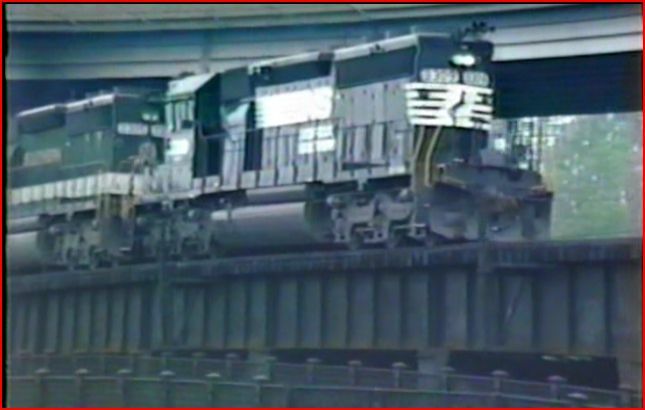 Continuous Norfolk Southern action, that doesn’t overstay the scenes. 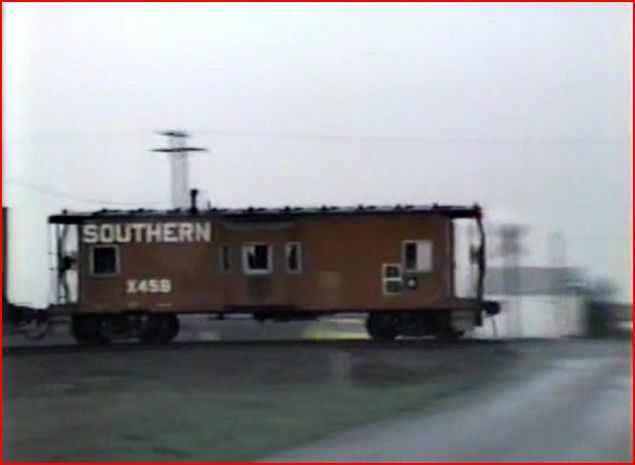 The trains are shot in a variety of weather conditions. 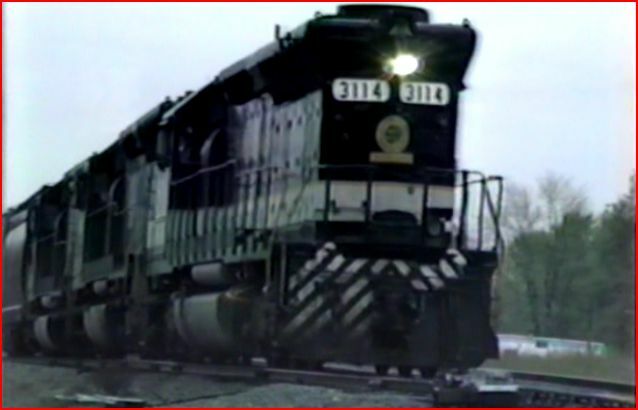 Early Norfolk Southern is a definite, blast from the past. If you are a newcomer to the Heritage Series, this one is a fine choice. Veteran railfans will recognize the value of this collection. Model railroaders will find plenty of freight cars and Southern cabooses to see. This program is jam packed with trains! In summary, as far as their Heritage Series: this the best one yet, from Diverging Clear Productions. 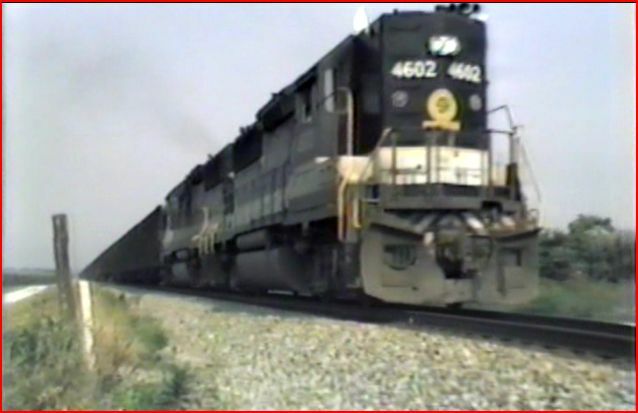 This entry was posted in ATVR Reviews, Diverging Clear Productions and tagged American Train Video Reviews, new releases, Norfolk & Western, Norfolk Southern, Railroad, Train DVD by William J. Hudson. Bookmark the permalink.